Is The Fire Museum Haunted? Early Pueblo Volunteer Fire Depts. Fire Protection in the town of Pueblo, Colorado was about the same as in most western towns of the late 1860's. The bucket brigade was the only way to combat the fire. The town passed "An Ordinance Concerning Fire Department." in 1870 that contained 13 sections. These sections included naming a fire warden, several on the duties of the fire warden, disposing of ashes, chimney's and stove pipes, and gun powder handling and storing. There was also a section that required businesses to have 50 gallons of water in a barrel and three buckets, and homes were to have a 20 gallon barrel and one bucket outside in the event of fire. Calling for the creation of a fire dept. for the town of Pueblo, the local newspaper The Pueblo Chieftain ran an editorial in 1872 that stated: "This town with all its aspirations and all its enterprise, hauls all the water required for it's use from the (Arkansas) river in wagons and barrels, at an expense of nearly $200 for each family annually. The water brought by the carriers is poured into a barrel sunk by the side of the house, and there it remains to be heated in the sun, invaded by dust, visited by dogs, rooted over by hogs, doctored by skunks, and mixed up with corruption generally, until replenished the next day. These are the water facilities that the metropolis of Southern Colorado boasts today." Showing that sarcasm was alive and well in the 1870's, the Chieftain went on to say; "Should a fire break out, the programme of operations to be pursued is very easy and simple. First, by all means, exhaust your water barrel, three or four bucketsful of water will do it, then pack up your valise, pitch the looking glass and the tongs out of the second story window, fling the children after, and then dig out for the bluffs, where you can sit calmly down and see your property burn." In late November of 1872, the first meeting was held for the Pueblo Fire Company, where W. Bingel was elected President. Plans were made to purchase the hook and ladder truck that the Denver Fire Dept. had for sale. Delivery of the hook and ladder truck was made on February 20, 1873, and the Pueblo Hook & Ladder Company No. 1 was born. George Kossman was elected Foreman (he was also the Fire Warden), with Z. G. Allen was the 1st Asst. Foreman. The truck was paraded through the streets, and a demonstration of the truck was given by Denver Fire Dept. firemen. The need for water at a fire was apparent at several fires over the next year. The fire department usually just helped remove the contents of a burning building or the adjacent buildings. Or they would use their hooks to pull down the wooden buildings in the fire's path. The old bucket brigade still put out the majority of the fires in their beginning stages. Several water works projects were started, and many more were planned, but none amounted to anything, until the Holly Water Works was voted on by the city council, with $120,000 in bonds being sold to fund the system. On June 24, 1874, the cornerstone was laid for the water works building at the corner of 4th St. and High St. (which is now Grand Ave. in Pueblo.) Below are pictures of the cornerstones laid at the original building. Three buildings have been built on the site, and is the current site of the Pueblo Board of Water Works office building. The cornerstones are located in a brick sculpture on the corner of 4th St. and Grand Ave. The water works was named after Birdsall Holly, inventor and businessman. The Holly Manufacturing Company designed and oversaw the installation of the water system, which used a stationary "fire pump" that pressurized and distributed the water throughout the town. The building on 4th St. was seperated into two rooms, the engine room and the boiler room. There were four single-piston engines with 10" cylinders in the engine room, along with four (6" cylinder) piston pumps and two rotary pumps. There were two boilers that measured 12 foot long by 54 inches in diameter and weighing 7,500 pounds each in the boiler room. Each boiler had 48 tubes inside, three furnace doors for the coal-fired furnaces with an 84-foot smokestack, three dampers, and steam domes. The capacity of the works was a million gallons a day. A well was made under the building for the water supply, which was fed by a 3-foot diameter pipe from a filtering well on the Arkansas River. Four miles of iron pipe of various sizes distributed the water in town to the 48 fire hydrants that were initially installed. The fire hydrants were used only for firefighting for the first year. Then the businesses starting using the water from the hydrants before the water started being piped into the individual buildings. The original hydrant installed in Pueblo. 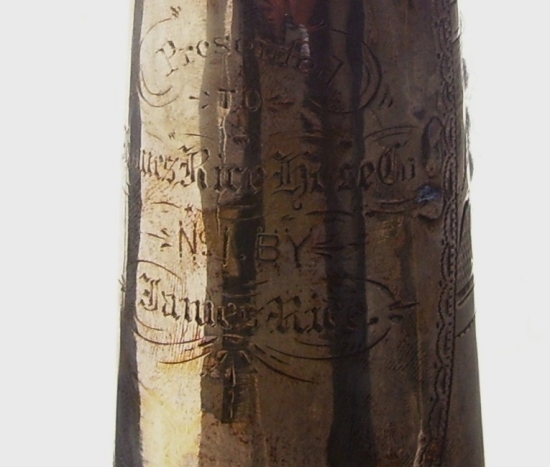 It was originally painted a royal blue with bronze stipping (above and below). Born with the water works were the hose companies of the volunteer fire department. Initially, there were two hose companies. They were the James Rice Hose Company No. 1 and the J. A. Richardson Hose Company No. 2. The Rice Hose Co. No. 1 was named after James Rice, the mayor of Pueblo and owner of a cigar store on Santa Fe Ave. They elected R. M. Stevenson as the foreman and W. H. Middaugh as the 1st asst. foreman. James Rice Hose Co. Belt in display at the museum. The Richardson Hose Co. No. 2 was named after the chief engineer at the Holly Water Works, and elected W. H. Redmond as foreman and (future judge) C. J. Hart as the 1st asst. foreman. The hose carts arrived on August 28, 1874 from the Silsby Mfg. Co. of Seneca Falls, N.Y. They were made entirely of iron, except the wheels which made of wood and iron. They were painted "bloody red" and "though not expensively ornamented, they were exceedingly serviceable machines." Each hose cart could carry up to 800 feet of rubber hose, and had a gear-crank to reel in the hose, state of the art for the day. During this time, the Pueblo Hook & Ladder Co. No. 1 was busy having their hook and ladder truck refurbished, under the direction of Foreman G. Q. Richmond. Richmond was an attorney, future mayor and delegate for the statehood ceremony for Colorado in 1876 in Washington D. C. Their truck was ready for the water works official unveiling on November 9, 1874. The entire department turned out in their uniforms for the parade led by Pueblo Fire Dept. Chief W. R. Macomb and Asst. Fire Chief R. M. Stevenson. The Pueblo Hook & Ladder Co. No. 1 was next, led by Foreman G. Q. Richmond and 26 members of the company. Two bay horses were borrowed to pull the newly refurbished hook and ladder truck. Following the hooks was the James Rice Hose Co. No. 1, led by Foreman W.H. Middaugh and 23 members, then the J. A. Richardson Hose Co. No. 2 were next, led by Foreman G. H. Redfield and 25 members. The Pueblo Chieftain commented on the fire department how "neat and tasty in appearance, and their marching was exceptionally good." The parade ended at the Holly Water Works at 4th and High Streets. The contract called for three 1-inch streams thrown 100 foot high, so hoses were hooked to three seperate hydrants, and using just the four piston pumps, the three reached a height of 220 feet. The heights were checked by the chief engineer of the Denver & Rio Grande Railroad. Mr. Birdsall Holly, who was on hand for the ceremonies, was said to be especially pleased with the test, being the most successful test of any of the 55 Holly systems in use. When they stopped testing, they had eight streams hooked to eight seperate hydrants throwing water streams of 145 feet. That evening, the 2nd Annual Fireman's Ball was held at Chilcott's Hall. A few days later, The Pueblo Chieftain ran an editorial that said: "Good-bye water barrels! You were a pretty good institution in your day, but like a good many men in the world at present, you have outlived your usefulness. No more chopping ice in the winter and fixing leaks in the summer; no more upsetting you in the streets and getting arrested for it, just because a fellow can't see straight and happens to run against you. Good-bye old barrels, and be d-----d to you." On November 21, 1874, two weeks after they started joint training sessions, the hose companies got into a water fight. Things got out of hand and Officer Castle of the Pueblo Police Dept. was cut by glass as he was standing inside a business. The hose streams hit the front glass, and Officer Castle was cut by the flying shards and required the attention of a doctor. The city council passed an ordinance at the next meeting forbidding the department from squirting each other when training or at a fire. 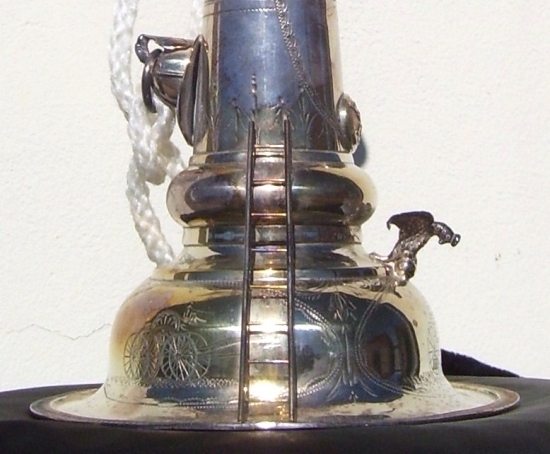 A presentation trumpet of the No.1 hose company in 1874. In 1875, The Pueblo Chieftain printed the first annual report from the Fire Chief of the Pueblo Fire Dept., and listed the following for the department. The James Rice Hose Co. No. 1 - 228 N. Santa Fe Ave. - Equipment: hose carraige, 750 feet rubber hose, 2 brass play pipes, 1 rubber play pipe, 4 one-inch nozzles, 12 spanners, 2 plug wrenches, and 1 axe. The J. A. Richardson Hose Co. No. 2 - Main St. & 7th St. - Equipment; (same as the Rice Hose Co.). The Pueblo Hook & Ladder Co. No. 1 - 4th St. and Main St. - Since the equipment belonged to the company, it wasn't listed in the chief's report. Besides fighting fires, the members of the different companies began challenging each other to hose races in 1877. This was the rage among the volunteer fire companies in all the big cities. 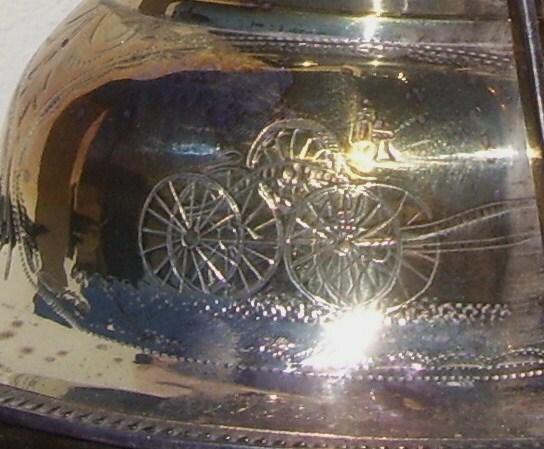 The Colorado Volunteer Firemen's Association held a state tournament starting in the early 1870's. They set the rules for the races, which for the hose/hydrant race was they would pull the cart 500 feet, to a fire hydrant, peel off 200 feet of hose, attach to the hydrant on one end and attach a nozzle to the other end, turn on the hydrant, and the timer would stop when water came from the nozzle. The ladder raise race (for the hook and ladder companies) would pull the ladder trucks 500 feet, raise a 25 foot ladder, and the "ladderman" would climb the ladder, the timer being stopped when he touched the top rung. Pueblo was chosen to host the state tournament in August of 1878. The practice track on Santa Fe at 10th St. was refurbished for the games. Over 5,000 visitors came to Pueblo for the three day event, almost doubling the population. Of the teams participating in the tournament, five were from Denver, four from Georgetown, three from Central City, two from Boulder, one from Golden, a team from Dodge City, Kansas, besides three teams from Pueblo participating. From Pueblo the Rice Hose Co. No. 1 was led by captain George L. L. Gann, and the team wore "white shirts trimmed in blue, black pants and fatigue cas, blue stockings and white breeches." The Richardson Hose Co. No. 2 was captained by W. H. Hyde and wore "white shirts, blue knee breeches with white stripes and pearl buttons, and skull caps." The Richmond Hook & Ladder Co. No. 1 was led by captain Moritz Lehman, and wore "salmon colored tights, blue velvet trunks with gold fringe and spangles, lavender silk handkerchiefs tied around their heads, and white shirts." 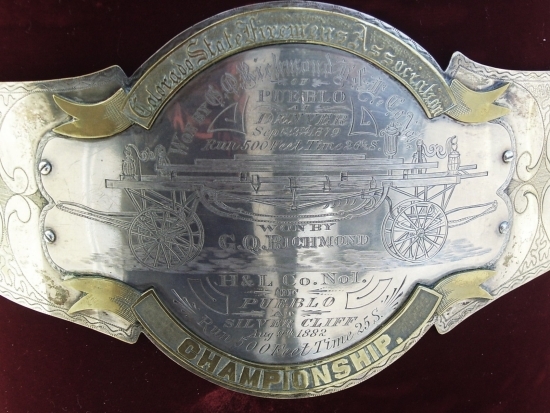 The Star Hook & Ladder Co. from Georgetown and the Joe Bates Hose Co. of Denver won the coveted belts in the premier events. There were also lesser contests like the straight-away runs (pulling either hose carts or ladder trucks 500 feet), foot races and such. The Richmond Hooks won the Hook & Ladder Straight-Away Race and received $50.00 in gold and a silk banner. The following year, the Richmonds Hooks would win the silver belt, a silver trumpet, and $75.00 in gold. The above picture is from a hose cart team from around Denver. South Pueblo officially had a fire department when the J. B. Orman Hose Co. No. 1 took delivery of their hose cart on May 2, 1880. They had also built a water works system that drew water from a lake south of town and brought it through eight miles of pipe with 15 hydrants. Their first test with fire happened on July 25th, and didn't do so good. They had trouble unreeling the hose, and then it was discovered that there were no hydrant wrenches in the hose cart. An old fashioned bucket brigade ended up putting out the fire. They would practice and get better. In 1881, Pueblo added a third hose company, the W. H. Hyde Hose Co. No. 3. Their hose house was located in the 1200 block of Greenwood Street. South Pueblo also added another hose company with the W. W. Strait Hose Co. No. 2 "on the bluff" (the mesa junction of Pueblo). Their hose house was located about where the outdoor steps of Rawlings Public Library at 100 E. Abriendo Ave. In 1882, the town of Bessemer organized a fire company. Bessemer, a town south of South Pueblo, would merge with Pueblo in 1895. Pueblo added two more companies in 1882, the Robert Corkish Hose Co. No. 6, who's hose house was located in the 400 block of W. 4th Street, and the East Pueblo Hose Co. No. 5, located on the northwest corner of 5th St. and Fountain. The state tournament was still a big deal, though the Orman Hose Co. was the only Pueblo area company to participate. In 1882, Pueblo sent the Richmond Hook & Ladder Co., and South Pueblo sent both the Orman and Strait Hose Companies. The Richmond Hooks ended up winning the coveted belt that year. Above is the Hook & Ladder Championship Belt. Below are ribbons given to the Richmond Hook & Ladder Co.
Sam Herd, in the above left picture, ribbon on the right, would become both a chief on the volunteer fire department (1881-82) and on the Pueblo Fire Dept. (1897-99) The small picture on the right is Herd. On September 25,1882, The Pueblo Chieftain printed the following summary of Pueblo Fire Chief Sam Herd's report on the fire department to the city council: "STRENGTH OF THE PUEBLO FIRE DEPARTMENT- 127 active members, including chief, assistant chief, and foremen of five hose companies and hook and ladder company. APPARATUS IN SERVICE- five hose carts, one Caswell hook and ladder truck, all in good condition; 2,800 feet of good, servicable hose, 650 feet of unreliable hose, and 1,300 feet of condemned hose, as well as wrenches, axes, ladders, spanners, lanterns, caps, belts, coates, rope, buckets, and 52 uniforms. There are 92 fire hydrants in the city, most in good condition." On the last halk of 1884, the Pueblo Volunteer Fire Dept. was in chaos. The department members had voted for the re-appointment of Henry O. Morris as fire chief in October, but the city council voted 7 to 2 not to re-appoint Morris. The following week, the city council appointed J. T. Dofflemeyer as fire chief. The McCord Hose Co. No. 3 and the Corkish Hose Co. No. 6 resigned as hose companies along with 30 firemen. At the city council meeting on November 3, 1884, the fire department committee reported the resignation of J. T. Dofflemeyer as fire chief, as he had moved to Kansas City. A week later, council appointed James O'Brien as the new fire chief. In December of 1884, a new hose company was being formed by citizens who weren't allowed in any other hose company, the African-Americans of Pueblo. A hose cart and the No. 2 hose house (in the 100 block of W. 5th St.) was issued to the new company by the city council. On January 8, 1885, a fundraising ball was given by the newly formed company at the Montomery Opera House. The George M. Chilcott Hose Co. No. 2 was created and accepted by the city council of Pueblo, due to the fact that participation in the volunteer fire dept. was at an all-time low. The African-American men of Pueblo had tried to form a second hook and ladder company, using the old hook and ladder truck of the Richmond Hook & Ladder Co., but the city council had turned them down and given the truck to South Pueblo. South Pueblo never formed a hook and ladder company. The Chilcott Hose Co. elected officers for the company at the same time the ball was given, though only Foreman James Pate and Secretary B. F. Harrison were mentioned. The hose company was the hot topic in town, and had their first fire on January 14, 1885. They were the only hose company to turn out to the alarm, finding a stable on fire at 7th and Court Streets. They managed to save the horses and a buggy, and kept the fire from spreading to the residence of the stables owner. At this same time, Henry O. Morris (the former fire chief who was also an insurance agent,) had written two letters to insurance journals in New York and Chicago, stating Pueblo was virtually without fire protection. For several weeks, angry letters and editorials in The Pueblo Chieftain traded insults from former members of the fire dept. and members of the city council. The issue caused the Colorado Insurance Association to send a representative to Pueblo to determine the accuracy of the stories. On January 26, Col. James McClure came to town from the state insurance association. He put in a surprise alarm that afternoon from alarm Box 22 (at the corner of 5th St. and Santa Fe Ave.) to test the response of the fire department. The Chilcott Hose Co. No. 2 were at the alarm box with their cart within a few minutes, followed by the Carlile Hose Co. No. 1 and the Warneke Hook & Ladder Co. The water pressure was soon demonstrated from the fire hydrants, and soon several hoses were spraying water. That night at the city council meeting, Col. McClure gave a report on the response and the condition of the fire department. He said the department was in much better shape than reports had indicated, but listed several recommendations to improve the fire department. Resolutions were then passed and votes were taken, and the fire department was given a passing grade. A fire on March 17, 1885 at the corner of 4th St. and Summit (now Albany). Quoting The Pueblo Chieftain; "The only fire company at the fire was the George Chilcott Hose Co. No. 2, who arrived in pretty good season, considering the distance they had to go, and rendered good service." They were the only company to hold monthly meetings, and after being the only company to respond to several fires, started bringing the hook and ladder truck with them also. This continued until September, when the city council accepted the resignation of Chief O'Brien. Moritz Lehman was then voted in as fire chief. He was a member of the old G. Q. Richmond Hook & Ladder Co., was a member of the champion running team, and was an experienced fireman. On September 18, Lehman turned in an alarm to test the departments response. Within a coouple of minutes, 8 members of the Chilcott Hose Co. were at the alarm box with the cart. Over the next several minutes, 3 more members of the Chilcott's arrived, but no other companies arrived. The chief wasn't pleased with what he saw and went about re-organizing the fire department. At the September 21st city council meeting, the first order of business was a letter from Foreman James Pate of the G. M. Chilcott Hose Co. No. 2, "asking that they be admitted to the new fire department now being organized by Mr. M. Lehman, and promising to be as faithful in the future as they had in the past." The letter was referred to the fire department committee. Later in the meeting, a report from Fire Chief Moritz Lehman stated that the Carlile Hose Co. No. 1 had an average attendance at fires of 2 to 3 members, and held no monthly meetings. The George M. Chilcott Hose Co. No. 2 had an active roster of 22 members, held meetings at least once a month, and was in good condition for active and efficient service. The report went on to say that the J. McCord Hose Co. No. 3, the East Pueblo Hose Co. No. 5, the Parr Hose Co. No. 6, and the Warneke Hook & Ladder Co. had attended no fires in the previous 10 months. In closing, Chief Lehman stated that with the exception of the Chilcott No. 2, Pueblo didn't have a fire department, and asked for permission to disband the entire department and organize a new one. Alderman Morse wanted to know how this would affect the Chilcott Hose Co., with Alderman Arthur opposed to disbanding the Chilcott's without good cause. "The company had done splendid work, and it was not right to do away with them now that there was an opportunity to do as well or better." Chief Lehman said he had the names of 110 men if the old department disbanded. Alderman Morse objected to any "dishonorable action" pertaining to the Chilcott Hose Co. Alderman Wall "had no objection to a colored company, but thought it was a question of having a department without a colored company, or having none with it." Alderman Gill thought it was a question of the best interests of the city, and the Chilcott's "wouldn't stand in the way when the matter was properly explained to them." Mr. W. H. Woods, secretary of the Chilcott Hose Co. No. 2, was requested to address the council. "He explained at some length, the circumstances connected with the organization of the colored company. He said the company had been organized by request of the members of the city council at the time the present chief and the old Pueblo volunteer fire department had disbanded, owing to non-compliance by the council with some requests made by the department. The members of the colored company had endeavored at all times to perform their duty, but if the city council wanted to disband the only fire company it had, all well and good if such disbandment was for the city's interest. In such event all the company asked was repayment to them of $39.90 for an outfit purchased from George L. L. Gann. They had done their duty in the past, and did not propose to be ugly about it (disbanding)." Chief Lehman said that 15 or 20 men would work with the Chilcott's, but 90 or so wouldn't. At this point, Foreman James Pate and Sec. Woods had a meeting with the fire dept. committee. When the meeting concluded, Mr. Woods addressed the council; "Since the department couldn't be organized with a colored company, the George M. Chilcott Hose Company No. 2 would respectfully submit their resignation." Alderman Morse then read the following vote to pay $39.90 to the hose Company. RESOLVED, That the thanks of the city of Pueblo and of the city council, are hereby tendered the officers and members of the G. M. Chilcott Hose Co. No. 2, for their constant, unwearried, and efficient service at every fire that has occured in the city since their organization. True to his word, Chief Lehman went on to organize a new fire department, with six active hose companies and the old Richmond Hook & Ladder Co. again a thriving company. In his two years as chief, Lehman built the department up to the best it had been up to that point. James Pate, the foreman of the Chilcott Hose Co., would go on to be the first African-American police officer on the Pueblo Police Department, and would finish his career as a prison guard.